Some say that war is one constant battle after another. When in reality it’s a game we play called hurry up and wait. We march during the day, sometimes too many miles to count. At night we set up camp and sit around the campfire telling stories of home. I had met Jedediah shortly after I had joined the Confederate Army. He was a tall skinny fellow about my age. A quiet sort. While most of us would talk about home, Jed would sit there and whittle the time away. It was always the same thing. He would help us set up camp by gathering wood for a fire. He always would eye the wood. One night he picked up a branch of hickory and eyed it up. He then measured it with his hand and foot. A smile came upon his face as he took his pocket knife out of his front pocket and began to whittle the bark away. We were lucky, our regiment was told to stay put where we were. Night after night Jed would whittle away on his stick. The rest of the boys were making bets as to see what Jed would make out of that old piece of hickory. I didn’t get in on the bet, instead I just watched in awe as I watched a master at work. One night Jed stopped whittling that old piece of hickory. It was nothing more than a piece that measured about sixteen inches, give or take. One side was flat, while the other side was kind of round. That night, Jed just sat at the fire listening as Simon told us stories. Simon would always end his stories by lighting one of his cigars, he kept in a box. Jed waited and listened. When Simon reached for his box of cigars, Jed sat up straight and asked for the box. We were all surprised to hear Jed speak. I think that was the first time that any of us had ever heard his voice. Some of us had thought he was what you call a mute. Mute or not, Jed could shoot and that’s all we cared about. Simon was shocked as well. He took the rest of the cigars out of the box and handed Jed the box. “Much obliged.” said Jed as he nodded and took the box. The next night, we all watched as Jed took that pocket knife out and began to whittle on that old cigar box. The next day, Jed had connected that box some how to that hickory stick he had whittled on. Later on he pounded four nails to the top of that there stick and strung some wires he had taken from a screen door on a house we passed on our last march. Night after night we all would gather around as Jed played that old cigar guitar. Months later a feller joined in with his mouth organ and after that someone else had brought their fiddle. More and more, time was passed pleasantly with the sweet sounds of those three men and their musical instruments. I think that was what got me through the horrors of that dreadful war. I was what they called a replacement. I was taking the place of a dead soldier. I can remember my grandpappy telling me stories of the War of Northern Aggression. He would always tell me that the worst part of war was not the bullets looking for you, it was passing time waiting for those bullets to look for you. While he told me stories about fighting against the Union soldiers, he also taught me how to make my own cigar box guitar. There I was in the trenches of a land called France, waiting for them bullets to find me. It had been hours since the last time bullets were flying over head. None of the guys cared to talk to me. You see I was just what they called a replacement. No matter, I was left to my own thoughts. Grandpappy always told me that I would know when to make my own cigar box guitar. It had been quiet for some time now, so I reached into my pack and pulled out the cigar box grandpappy gave me before I left home. Inside were some wire and a pocket knife. Just as pappy taught me years ago, I began whittling the ‘neck’ of the guitar from a piece of wood that fell in the trench I was in. The rest of the men in my trench eagerly watched as I strung together my home made guitar. Most of them were doubtful to whether it would play or not. But, that night - well we had the most fun, throughout the whole dang war. As the barrage of bullets sought us out, the men and I would guard that old guitar with our lives. Then when the bullets stopped, the music started and we were all put to rest from the constant fear of catching one of them there bullets. I guess it all started in boot camp. Me and the boys from my unit would spend our time off out dancing. I would sit there night after night listening to the guitar as the young lady would pluck it’s strings. The boys thought that I was in love with that dame. Maybe I was, but I think I was more in love with that guitar. One night at the USO club, that dame walked up to me and asked why I never danced and why I kept staring at her. I told her I was not staring at her but at her guitar picking. That was the night she showed me how to play. Each night that I had off, I would meet with that dame and she would teach me more about the guitar. Not only was I learning how to play, but I was falling in love with that beautiful dame. A couple of the guys and I would take turns playing that guitar. I think it was pass around more than cigarettes. Some how I had managed to drag that guitar with me through all of Europe. We passed more lonely nights playing that old guitar. I thought that winter in Wisconsin was cold, but this place is colder! I can still remember the day that my pop caught me going through his foot locker in the attic back home. I thought he would have tanned my hide for sure. But he carefully lifted up his old uniform to reveal a small guitar. I asked him about it and he told me that this guitar had seen more battles than the United States flag. Here I sit in Korea, playing the same songs that pop’s played in World War II. He was right when he said that the guitar was a weapon of peace. The strings may be warn and the body has seen better days. But as my fingers fly across the neck, my soul is warmed to memories of the comforts of home. My grandpa once told me about how his dad and grandpa served in war. As a kid, I could sit for hours listening to the stories about how they would make cigar box guitars. Now here I sit in the middle of a jungle, swatting at mosquitos and dodging bullets. I’m so sick of sweating and I long for the cold winter nights of Minnesota. We get to head back to base camp tonight. That means a cold shower, clean clothes and a warm meal in our bellies. I had learned how to play the guitar from grandpa. Listening to his stories about cigar box guitars made me want to build my own. Back at base camp, I’ve been working on one. My bunk mates think that I’m crazy. I just laugh with them and tell them it’s an old family tradition. Bobby is the only one that doesn’t laugh. Some how he smuggled in a guitar. I don’t know how he did, but he got it in here some how. I just wish he could bring it with when we go out on patrols. But, then again, the damn Viet Cong would know where we are. Bobby can sure play. You know there is something soothing about hearing him strum those strings. I wonder what my guitar will sound like. Sand, I’m surrounded by sand. As a kid, I always loved the beach. I would ride my bike down to the state park everyday during the summer and spend the day on the beach with my friends. Now all I want to do is take these damn boots off and walk through the green grass back home. I got a package today that contained a guitar. I’m so excited. I had to leave my other guitar behind because of weight restrictions. This new guitar is perfect. It’s small, compacted and it fits right in my bag. The only problem is that I’m so used to playing a full sized guitar that now I need to learn how to play this one. No matter, it’s still going to help pass the time. Grandpa once told me that I come from a long line of soldiers who played the guitar. I guess it’s a lucky family tradition. ‘Cause all of them made it through their wars. Musical instruments have been a vital component of war for thousands of years. The most popular musical instrument of war was the drum. Drums became a staple in a soldier's daily life as they provided cadences for marching and signals for battle. During the Revolutionary War drummers and fifers were used to signal when to fire. In the heat of battle, the grounds were often filled with fog or haze from cannon fire and visual command was nearly impossible. Therefore, musical instruments were the only way to convey orders to the troops as they were spread across the battlefields. By the time the Civil War broke out, many towns had acquired their own local bands. As the brave men marched off to war, members of these bands would follow. Technically, the bands would march ahead of the troops to provide cadences for them to march too. These bands were a symbol of pride for communities. Many officers as well as soldiers wanted them to join as it was a key element to boost morale. The bands were also the soldier’s only source of entertainment during their service. One unknown little fact about bands in the Civil War is this... On the night before a major battle, the bands from both sides would battle it out through song. The band on one side, say the North, would begin playing a song. When they would finish, the band on the opposite side would play their song. This would continue until one band would finally give up or both bands would end playing the ever popular song “Home, Sweet Home.” This form of ‘battle’ would boost the moral of soldiers, thus prepping them for the on coming battle. Another well known musical event that took place in war contained no musical instruments. During what is now known as the Battle of The Bulge, American troops were bunkered down in the dense forest of Ardennes in December of 1944. On Christmas eve Americans could hear German soldiers singing “Stille Nacht” other wise known as “Silent Night.” Quietly the American soldiers joined in, even though they believed it was a trap set by the Germans, to locate their positions. Even today, Soldiers often bring musical instruments with them when they are deployed. However, today’s Soldiers face a weight restriction when loading their pack and many of them must leave their guitars behind. In July 2011, the Cupit Travel Guitar was first introduced to the public at trade shows. Created by Jerry Cupit, President of Cupit Records, this guitar is small, compact and lightweight for easy travel. The Cupit Travel Guitar comes with it’s own custom fitted case that measures 22.5 inches long and weighs only 4.5 pounds. The case is designed with a single carry handle as well as backpack straps for easy transport. Since its debut in 2013, Guitars For Soldiers has had twelve sponsors that provided twenty-four guitars to soldiers serving around the world. Interesting sponsors can purchase a Cupit Guitar at the cost of $395.00 and Cupit Records will match that guitar with a second guitar. 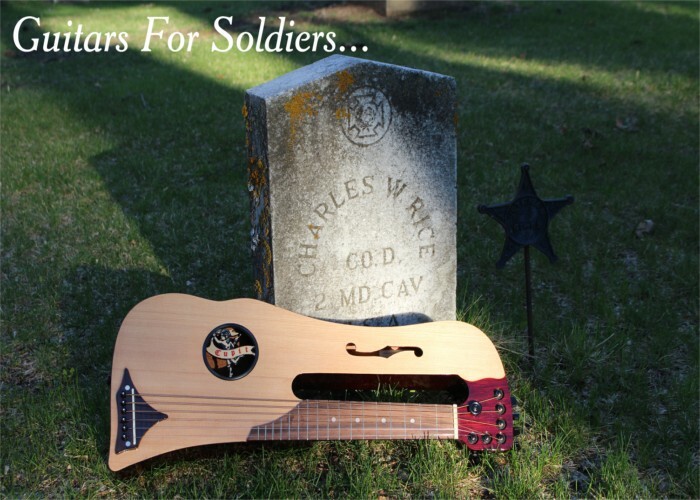 Cupit Records will then ship both guitars to individual soldiers who have already pre-registered to receive the Cupit guitar. For those interested in purchasing just the Cupit Guitar, Strictly Country has them available to purchase in our online catalog on our website soon. can only be brought to peace through music.